Just a quick post here to share a bit of what I was up to this past weekend. 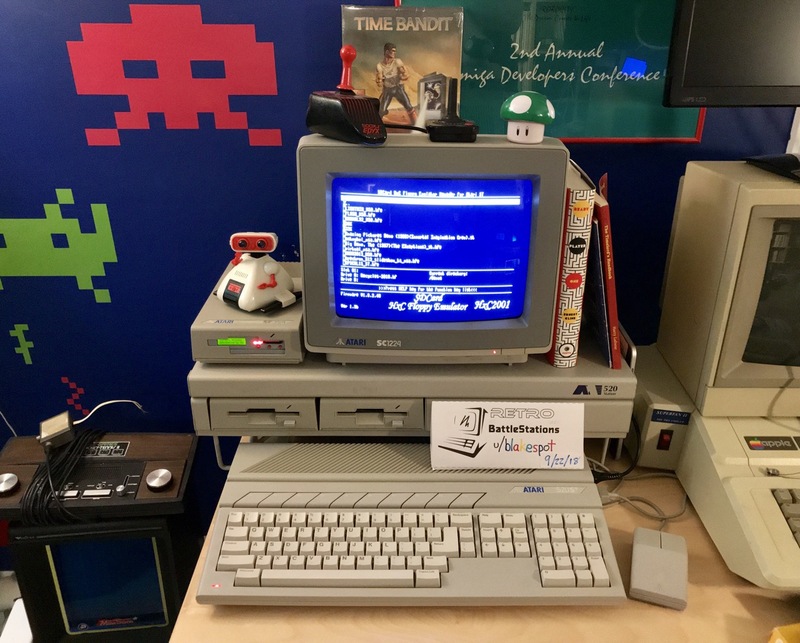 It was “Modern Touch Week” over at Reddit’s r/Retrobattlestations which was a competition to show a vintage system using recent / modern enhancement hardware (flash-based floppy emulators, graphics expansions, etc.) in the most extreme or over-the-top fashion possible. To meet the challenge I reached for my Atari 520ST which sports a recently-designed 4MB RAM expansion as well as an HxC 2001 SD-card-based floppy drive emulator that I built into an external floppy drive enclosure, as the original 520ST has no on-board disk drive (a design I prefer to the 1040ST and Falcon with their internal drives). I have never seen an HxC 2001 configuration like this and I consider it rather unique. The system stand / organizer shown is the A520 STation, a stand I had on my first Atari ST back in 1987 and one that that took me years to locate for my current collection. After submitting that entry it occurred to me that the ST’s neighbor (one to the left in the “Byte Cellar”) better matches the spirit of the challenge. The system I refer to is my fairly well expanded TI-99/4A (the ’99 was my first computer–Christmas 1982), featuring TI’s large, tank-like Peripheral Expansion Unit containing a 32K RAM expansion, a serial / parallel interface card, and a 5.25-inch disk drive and controller card. 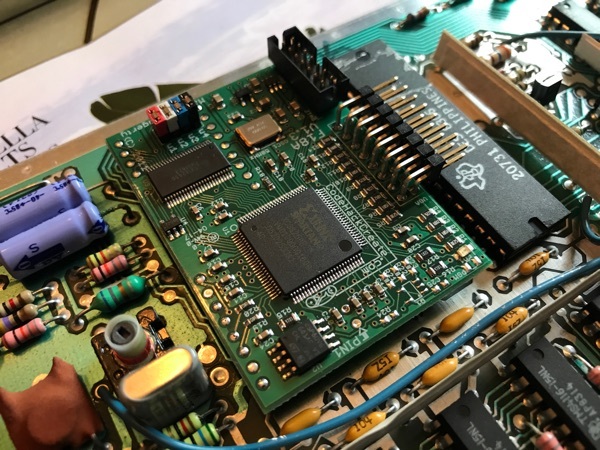 I recently removed the TMS9918A video display processor from the main system unit and replaced it with the F18A graphics board, an FPGA-based, enhanced version of the TMS9918A that provides higher resolution rendering allowing 80-column text, a 512 color palette, enhanced sprite capabilities, and 31kHz RGB VGA video output. I also recently purchased a FlashROM 99 cartridge, which accepts an SD card and presents a menu of cartridge command module ROM images, and it was this I used to load up TIMXT, a terminal program for the ’99 that supports the enhanced 80-column graphics mode of the F18A as well as ANSI character translation. This allows for a rather rich BBS experience, which I wanted to demonstrate in the photo submission. To get the TI logged into the BBS, I used a WiFi232 serial-to-Wifi modem bridge hanging off of the system’s Myarc RS-232 interface. At any rate, there’s a lot more going on with that TI, so I made a second submission to the contest. And that made for a pretty fun vintage computing weekend! 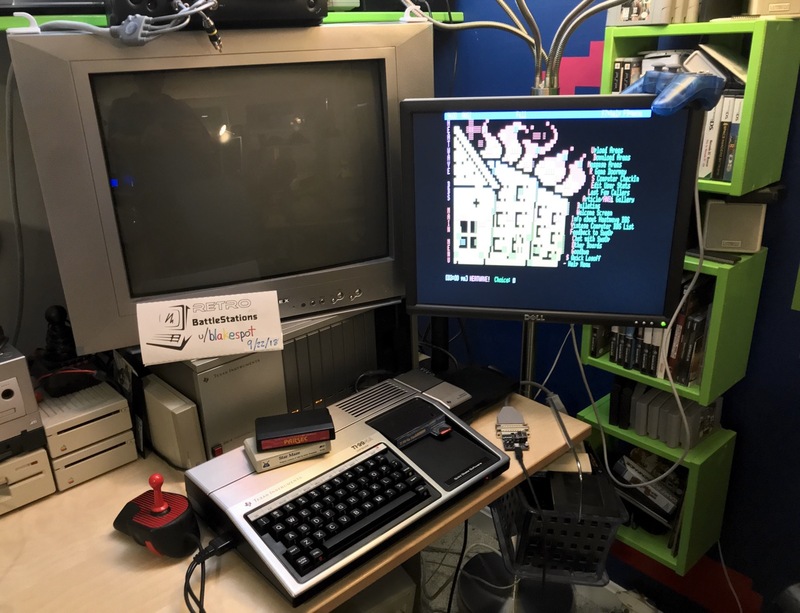 This entry was posted in Atari, r/Retrobattlestations, TI-99. Bookmark the permalink. My Atari ST is an unmodified Mega 2 with a SC1224 monitor and a 40 MB Supra hard drive. I had it out probably about 4 years ago and the keyboard had gotten a little flakey. I had to press some of the keys with real force to get them to take. I surprised how well it has held up given its age (I think this one shipped in 1987). It was the first useful computer I ever got. I wrote a lot of papers on it in college in WordWriter ST and WordFlair II. But once I moved on to the PC and Mac, I didn’t go back to the ST much except for games. Dungeon Master and Midnight Resistance were my favorites! I replayed Midnight Resistance last year in Hatari and it really was as fun as I remembered.